DARIEN — The way the Darien schedule is set up, every Saturday is a primetime contest. The Blue Wave have already taken down two nationally-ranked teams the last two Saturdays in Yorktown (N.Y.) and Torrey Pines (Calif.) and have Manhassett (N.Y.) on the docket this week. With that in mind, Wave coach Jeff Brameier aims to use his mid-week games to perfect schemes and timing. 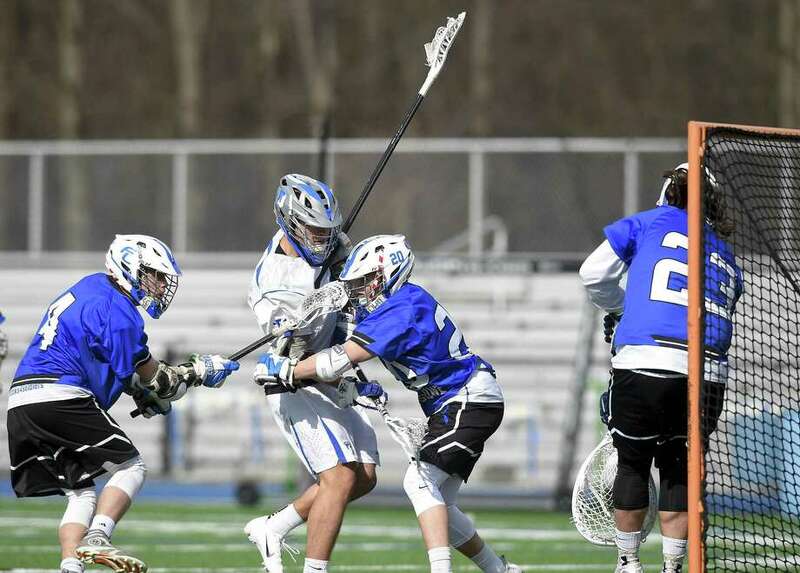 Darien looked pretty perfect Tuesday, downing Fairfield Ludlowe 17-2 at home. It was the Under Armour/Inside Lacrosse No. 13 Wave’s 58th-straight win. Darien (4-0) got to work in a hurry, erupting for 12 first half goals, led largely by its first line of Logan McGovern (six goals, two assists), Brian Minicus (five assists) and Hudson Pokorny (one goal, two assists). Aidan Wykoff scored in the first for Ludlowe (1-1) and Quinn Thompson got one in the third. The Falcons have started the year on a bit of a rollercoaster, winning an emotional opener 11-10 against Fairfield rival Warde before Tuesday’s drubbing. McGovern, Darien. The offensive ability of the four-year player is no secret, and it was on full display Tuesday, finishing with six goals and two assists. With the lopsided score, Brameier was able to get most of his 40-plus man roster involved. Several underclassmen made the most of it, including sophomore Michael Minicus (one goal) and freshman goalie Andy Demopolous (five saves). Falcon coach Chris Parisi wasn’t down after the loss, instead, focusing on using it as a learning tool. Records: L 1-1; D 4-0. Scoring: FL—Aidan Wykoff 1 goal, Quinn Thompson 1 goal; D—Logan McGovern 6g 2 assists; Blake Sommi 3g 1a, Ryan Darby 1g, Brian Minicus 5a, Hudson Pokorny 1g 2a, Jackson Peters 1g, Tanner Strub 1g, Jack Joyce 2g, Charlie Walsh 1g, Michael Minicus 1g. Goalies: FL—Carter Leibrock (16 saves), Michael Graney (1); D—Sean Collins (3), Andy Demopolous (5). Shots: FL—9; D—41.